An unpredictable game that, loosely speaking, involves "dodging numbers and rows". Its inherent chaos (and fun) increases with the number of players present. 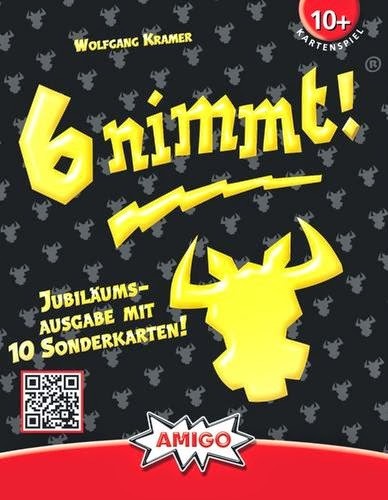 Name: 6 Nimmt! (1994) - also known as Category 5, Take 6! and sometimes even 6 who loses! Price Range (AUD): Approx $20 to $40 when you include shipping. I bought mine for $15.80 pick-up. If my memory serves me well, I remember seeing this game on sale for something ridiculous like $3.50 in a shop in the city - but I'm not sure why that happened or whether it was merely a fire sale. Editions: There is a jubilee edition which apparently incorporates joker cards ranged from 0.0 to 0.9 which act as wild cards. 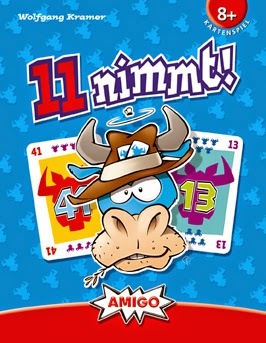 There is also 11 Nimmt! which is quite an interesting spin-off as it uses the concept of getting rid of all your cards (you must play a card not more than 10 points higher than the card in the stack - or else you have to take the stack of cards) but also incorporates an element of risk-taking in that you can choose to increase the number of cards you can play if you choose to take more stacks (which disadvantage you in the short-term, but are hopefully offset by the increased ability to play cards). Thanks to Sean for showing me this game. Availability: Seemingly available online but I can imagine this to be a game that isn't necessarily stocked a a matter of priority (but I wouldn't know for sure). This is a pretty decent card game for a multitude of people - the more people you have, the more chaotic the game gets (which probably makes it better - but, at the same time, a larger group makes the game arguably less strategic). Here's a brief summary of the rules. There are 104 cards in total, numbered from 1 to 104. Players each get 10 cards. Players each put a card face down and then all cards are simultaneously revealed. The cards get ordered into rows based on their value and in ascending order (See Rules below for a better explanation). Whoever's card is sorted into the 6th card of any one of the 4 rows takes all the cards (and hence, loses points!). These cards don't go into your hand but are used for scoring purposes. You don't want to take cards in this game as they are worth negative points. The inherent thrill in the game lies in the unpredictability of the outcome of each round. Given the rows of cards shown in front of you, you'll have to try to guess what other people are likely to play. Depending on what you think that is, you'll either try to play a high-valued card, a low-valued card or a mid-range card to stay out of trouble. If you don't like "numbers" (even in the general and simplistic sense of deciding which numbers are bigger than others) you probably won't like this game. The game also adds an option for "advanced play". Instead of being dealt a random set of 10 cards, each person gets to pick cards that are publically revealed to all players. This adds considerable strategy, although such strategic thought may be hard to logic out in a large group of people. * September 2014: Reduced marginally from 6.65. The game itself isn't too much better than 6.5 so I have adjusted this accordingly. It has a few quirks about it that make it a bit different, but that's about it. There is a measure of thrill in trying to duck or avoid collecting rows by playing high or low cards - a considerable amount of game theory is involved. Can be a good party game in certain, but not all, situations. Replayable if you are after something simple. People who hate the sight of numbers may not like this game - even though the game isn't really that mathsy! May be a bit clumsy to explain the rules at first - needs demonstration in the first round for people to understand what's going on. The inherent uncertainty and chaos associated with each round played (as players try to ensure they aren't the 6th card in a given row) makes for quite an interesting game. Everyone gets 10 cards to start the game. Each player should probably sort their cards into ascending order. The aim of this game is to avoid collecting cards. Since each person has 10 cards, there are only 10 rounds. In each round, every player plays a card face down. When everyone is ready their card is flipped over and revealed. 3) If any of the cards played are HIGHER than any of the values in the row, the card will be placed to the RIGHT SIDE of one of these rows. 4) If there is more than one row in which Rule 4 can be satisfied, the card played always goes into the row where the numerical difference between the card just played and the value of the card in the row is the lowest. For example, using the above numbers played (36, 38 and 99) the 36 card will have to be positioned first. Because it is higher than the numbers 30 and 13, it can potentially go into any of those rows. However, to satisfy Rule 4, it must go into the top row next to the 30 because 36 is closer to 30 than 13. Then the 38 card would NOT go next to the 36, but next to 37 as 38 is closer to 37. Then 99 would go next to 55. 5) If any of the cards played are LOWER in numerical value than all of the values in the row then a row will have to be removed. The owner of the card gets to select which row of cards they would like to take and "empty". They do so and replace that row with the card they played. For example, if a 1 was played on the next turn, the owner of the 1 can decide which row they want to "empty". The best option would be to empty the bottom row as that is only worth -1 points (not -2 points as in the second row). The number of bullheads on the card indicates how many negative points it is worth. The more colourful cards are more "dangerous" and should not be taken. The cards "taken" do not go into the player's hand but are used for scoring purposes - the more bullhead symbols you have the worse off you are (see below for a better idea). 6) If a card is placed in accordance with Rules 4 and/or 5, and the card played is the SIXTH card in the row, the owner of the card played takes the whole row. This is obviously very bad because the person who takes the row receives a lot of negative points. The number of negative points is shown by the number of bullhorns on the card. Then, if a person plays the 68 card and it's next to be sorted into the rows, it clearly fits into the top row. This would make it the 6th card in that row. This must obviously be avoided at all costs but it is usually hard to tell whether you will end up being the 6th card in the row (as you must anticipate what others will put down). Whoever has the most bullheads at the time the game ends loses. The game suggests that the game should continue until someone gets 66 bullheads (ie. gets -66 points). It can be a nuisance to keep track of scores though. Perhaps an arbitrary points total can be used to activate the end game. The top right card is actually a 66 (I put it upside down). It is red because it is a dangerous card to take, penalising the taker 5 points. For example, if these were the cards a person had at the end of the round (eg from taking the top row in the most recent example above), they would be on 1 + 1 + 1 + 5 + 3 = 11 bullheads = - 11 points.